Ed. note: Much like AHTR, but non-art history specific, Purposeful Pedagogy is a grassroots peer-led group that actively supports pedagogical inquiry for higher education teachers. PP is specifically geared towards providing support for graduate students who are teaching for the first time in a university setting, aiming to train junior teachers across disciplines at the university level. After attending the first annual meeting PP held at the CUNY Graduate Center last year, AHTR thought a word from their organizers–PhD students and faculty from Urban Education and Sociology disciplines across CUNY campuses–might be of interest to the AHTR community. What follows will be especially helpful for anyone who is just getting started with their teaching practice. If you’re an advanced or senior member of faculty in your department, you may want to consider sharing this resource (along with a copy of John Bean’s Engaging Ideas – which should be every first-time teacher’s life belt!) with graduate teaching fellows and teaching assistants. The Purposeful Pedagogy resources book can be found here, and, if you’re NYC-based, they’re offering a free workshops throughout the spring semester (more info here, and below). Most doctoral students enter the classroom without any formal teaching experience or pedagogical training. Instead, they are often provided, at best, a quick orientation that offers tricks before entering the undergrad classroom as teachers. As a result, graduate students begin teaching without any support or training to help them be successful. Not only does this do a disservice to the graduate student teaching the course, but to the students in their courses as well. To begin addressing this problem, a group of former public school teachers, experienced graduate student adjuncts, and concerned full-time faculty formed a group to address the lack of time committed to assisting graduate students new to teaching. We were frustrated with the lack of teaching support provided to us and our peers at the Graduate Center and wanted a venue to share our experiences and expertise with others so they could enter the classroom better prepared and more confident. This resulted in the creation of the Purposeful Pedagogy Workshop. In designing the workshop, we tried to brainstorm what pedagogical foundation new teachers would need before entering the classroom and what was feasible to provide these individuals in a one-day workshop. 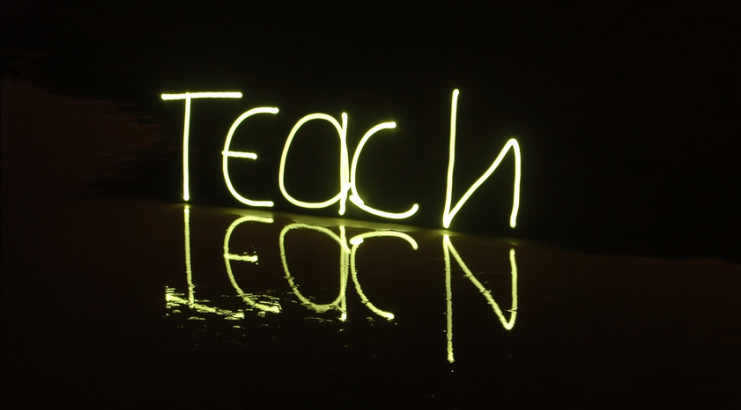 We knew that one cannot teach someone how to teach in a day; but we realized there are basic principles that every new teacher should understand before entering the classroom. 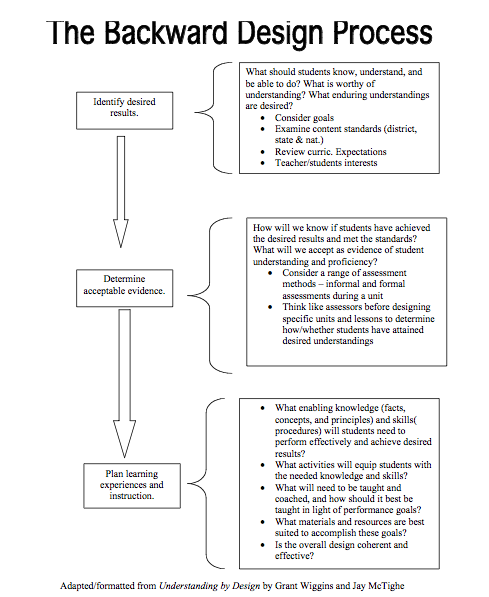 After much dialogue, we settled on the concept of Backwards Planning, which is outlined in much more detailed by Wiggins and McTighe in their book Understanding By Design (2005). 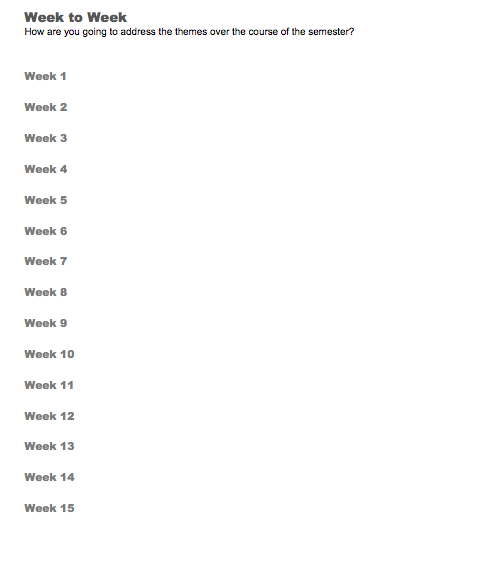 The basic premise behind Backwards Planning is that a teacher should begin the planning of their course, lessons, and activities by thinking about the end goal they want their students to learn or accomplish. In other words, the first step a teacher should take when preparing a course is solidifying what they want their students to learn by the end of the course. Once that is established, the teacher can then think about how they will assess whether students have learned that information and how they will specifically teach the content to help students achieve these goals. 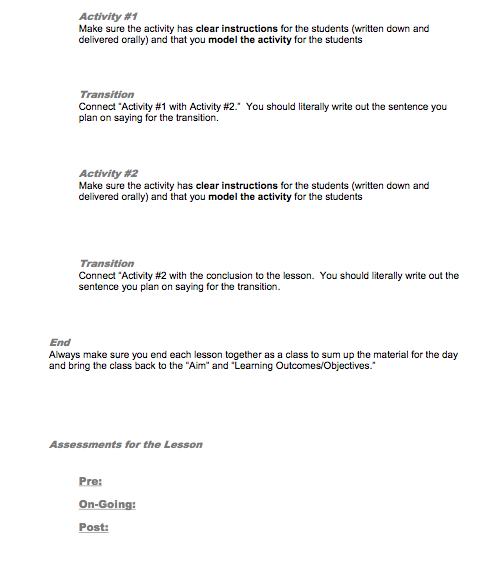 Using Backwards Planning as a framework for the workshop, we created three core sessions on: planning syllabi and lessons, implementing lessons, and assessments. 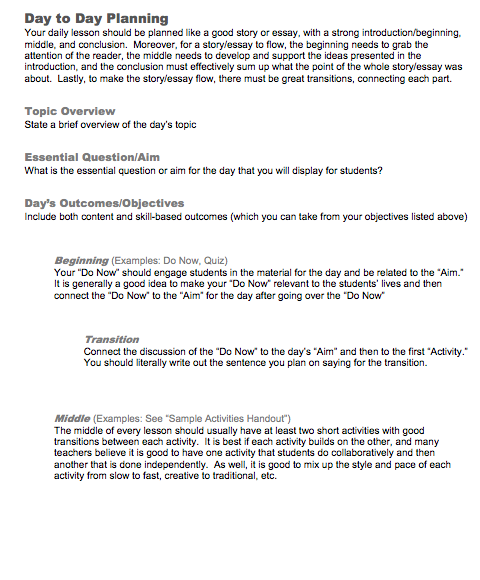 In each session, we tried to provide novice instructors with basic templates and samples that they could translate directly to their classrooms. However, since the goal of the workshop was, and is, to help prepare new teachers for the classroom and to ease the natural fear of teaching for the first time, we did not want to design sessions that relied solely on lecture. Instead, each session was crafted to integrate hands-on collaboration and application of the concepts taught. As organizers and facilitators, we understood that each new instructor has something to bring to the table and different experiences; therefore, we wanted to give people an opportunity to learn from one another and test out the strategies we were introducing. This created a very collaborative atmosphere where students were able to openly bounce ideas off one another and question, critique, and try the ideas presented by the facilitators. 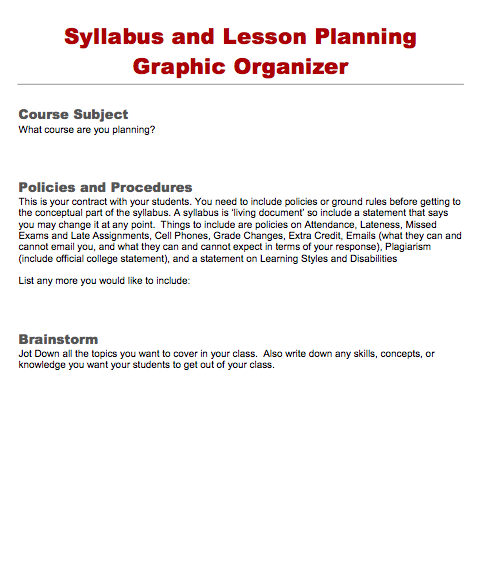 For instance, in our “Planning” session, we provided participants with a Syllabus and Lesson Plan Graphic Organizer for helping plan a course syllabus for the first time. It begins with determining the main goal of the unit. Then, there is a space to brainstorm ideas before clustering those ideas into themes. 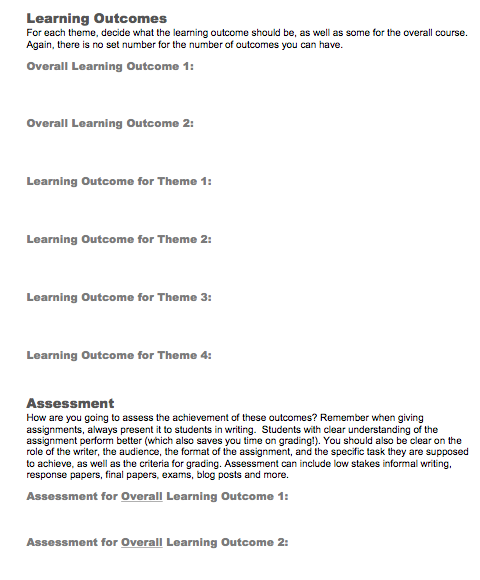 Next, it asks the teacher to think of the learning outcomes and assessments for each theme. 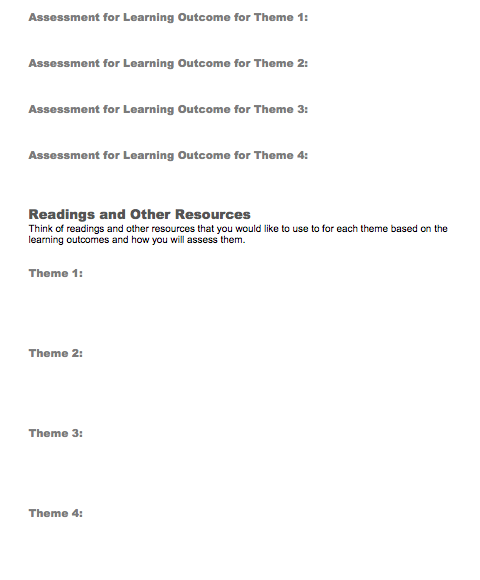 From there, one can think of the readings that best apply to each theme. 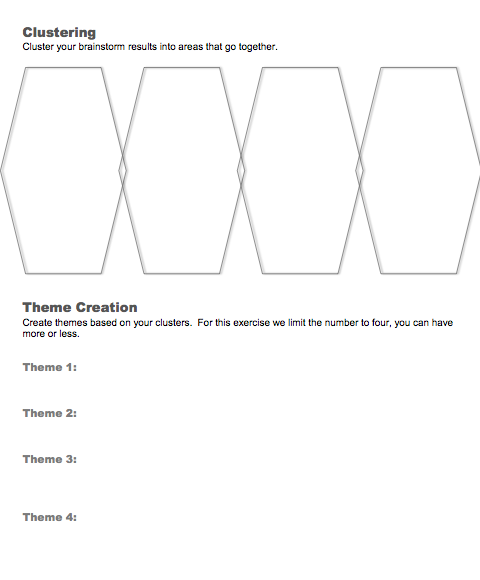 Lastly, the teacher can organize the themes and sub-themes into a practical sequence where ideas from one lesson build onto the next. 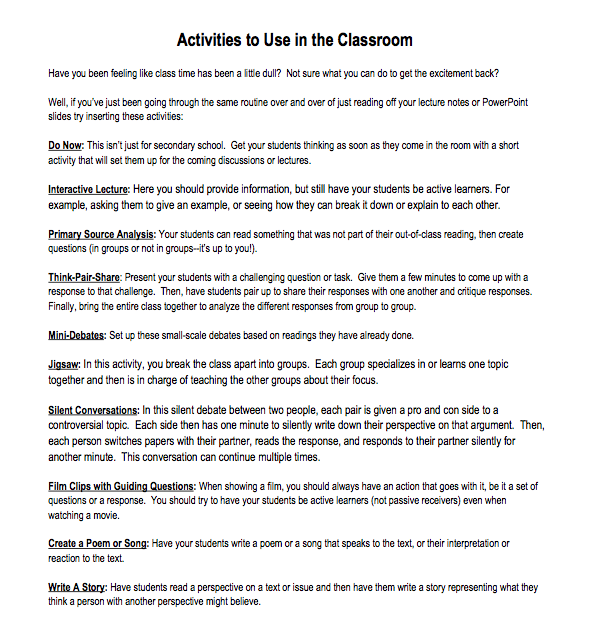 During the session, the student-teachers worked with one another to fill out this graphic organizer for a fictitious course in their subject area to practice how they might craft their own syllabus. We then shared and critiqued students’ work to evaluate what would work well in their future classes and why. In addition to creating a full day workshop with basic templates, samples, and strategies for teachers, our hope in facilitating Purposeful Pedagogy is to create a community of passionate educators who can collaboratively work to improve their craft. That is why, for the past couple years, we have held monthly follow-up sessions to the workshop where we focus on one specific issue raised by graduate students and provide a venue where we can all come together to break down issues individuals are having to improve their and our craft. We understand that teaching (like learning) is an evolving process; we must challenge one another to continue to reflect and grow on our practice. To do this, we need to feel comfortable asking others for help and advice. Purposeful Pedagogy hopes to provide a venue where that can start. While not all doctoral students will adjunct, most are seeking a career in academia. Therefore, it is critical that we start to think of ourselves not just as researchers, but as educators as well. This has not been the predominant mentality across academia; but it could be. We hope that our work with Purposeful Pedagogy can be a step in that direction. Works Cited: Wiggins, G. & McTighe, J.(2005). Understanding by Design. Expanded 2nd Ed. USA: Association for Supervision and Curriculum Development. Get involved with THATCamp CAA 2014!